Last Saturday turned out to a very busy day. I got busy in the kitchen baking pistachio cranberry cookies, making red chilli sauce and some arvi paan na bhajia. Arvi paan bhajia was suppose to be dinner. I prepared some lunch for Ajay and went to Bollywood Bite with my best friend for lunch and a long chit chat. The dosas were absolutely delicious and the chit chat endless as we both are in the very near future getting our sons married. Came home at around 4 p.m. to find my mamaji waiting for me impatiently. He wanted to apply for the UK visitor visas. Getting most of these forms filled online for the aged is not a laughing matter. He was so stressed out as he didn’t know how to go about it. Every time we have to fill in these visa forms, they are getting lengthier and lengthier. As my hubby comments, they know more about us than we do ourselves. Anyway after much stress and calls to his daughter in UK we managed to fill the forms online and my hubby offered him some tea to calm his nerves. Along with tea they had some cookies and arvi paan bhajias. By the time my mamaji left, I was in no mood to enter the kitchen to prepare some dinner as the bhajias were not enough. I stood for a minute or so with my fridge open, trying to figure out what to make. Out came some mango puree, thick yogurt, a small piece of cucumber and a handful of grapes. A huge appetizing salad got ready in a matter of few minutes and I was just in time to watch Jalak dhikla jaa one of my favourite programs. Everyone loves Madhuri, Karan and Remo… not saying that I don’t but I also love watching Manish Paul, witty, funny and a lovable person. Every season the dances are getting better, more professional and difficult. Coming back to the salad, the dressing tastes like the nice kacha pukka (raw to ripe) mango with salt and chilli powder we have in India and Kenya on the streets. Peel and slice the carrots the way you want. I peeled them with my peeler to get broad slices. Mix the salad ingredients into a serving bowl. I left the grapes whole. 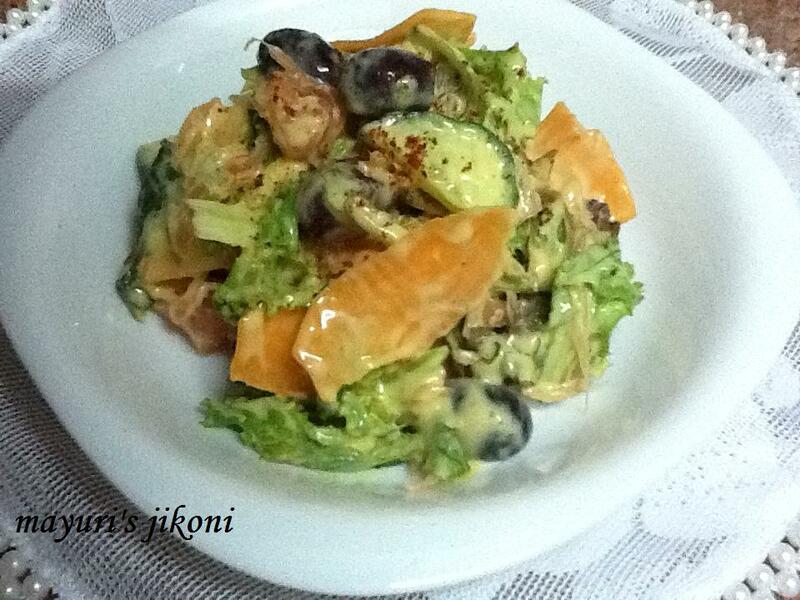 To prepare the dressing, mix all the ingredients well whip it a bit using a fork or a small whisk. To serve, pour the dressing over the salad. Feel free to use any other vegetables like sweet pepper, parboiled baby corn etc. Instead of grapefruit you can use other fruits like tangerine, apples,oranges etc. I used a ripe apple mango for the puree. You can use any ripe mango. Scoop out the mango flesh or cut using a knife. Put it in the blender with a little bit of milk and process it to get a smooth puree. Add about a ¼ tsp ginger paste to the dressing if you like.